Your Largo Ceiling Contractor specialists is the leader in Popcorn Ceiling Removal, Popcorn Ceiling Repair, Drywall Repair, and Texture Ceilings and Walls in Largo Florida. Our team of experienced workers helps to improve the value and look of your home while also making it healthier to live in. Why Would I Want Popcorn Ceilings Removal or Repair? Homeowners spend lots of time and money refurbishing their home without touching their popcorn ceilings. The lower half of their home looks lovely but the old, dramatic, dirty popcorn ceilings date the home to the 70's. Popcorn ceilings are a surface that will attract and harbor dust particles floating freely in your household air. Removing the popcorn ceiling and applying a surface that does not attract dust particles will help contribute to the quality of your indoor air. Homeowners spend lots of time and money refurbishing their home without touching their popcorn ceilings. The lower half of their home looks lovely but the old, dramatic, dirty acoustic ceilings date the home to the 70's. Removing the popcorn ceilings from your home will and bring your home up to date with textured ceilings. During this stage, you may be presented with an excellent opportunity to eliminate your popcorn ceilings. When remodeling, always work from the top down. First the ceilings and any lighting changes that may affect the ceiling. Next, the windows and walls, lastly, the flooring. This is the best time to remove popcorn ceilings from your home and replacing with a texture ceilings and walls. 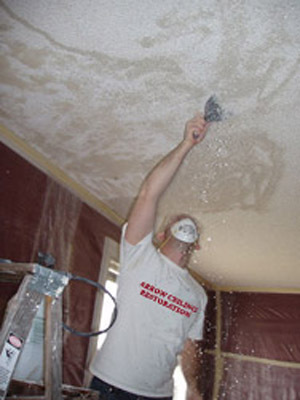 If you're looking for a Largo Ceiling Contractor Specializing in Popcorn Ceiling Removal, Popcorn Ceiling Repair, Drywall Repair, and Texture Ceilings and Walls, contact Arrow Ceiling Restoration today at (727) 804-5411, or complete our estimate request form.